Make a magical moment with this exquisite diamond ring from the Enchanted Disney Fine Jewelry collection inspired by Belle. Crafted in 9ct white gold, this wondrous style features a gleaming 1/4 carat of diamonds in a cluster formation surrounded by a square halo of diamonds. The split shank also dazzles with more diamonds, while the bridge hosts an elegant rose designed in rose gold. This ring will surely prove she is your princess. 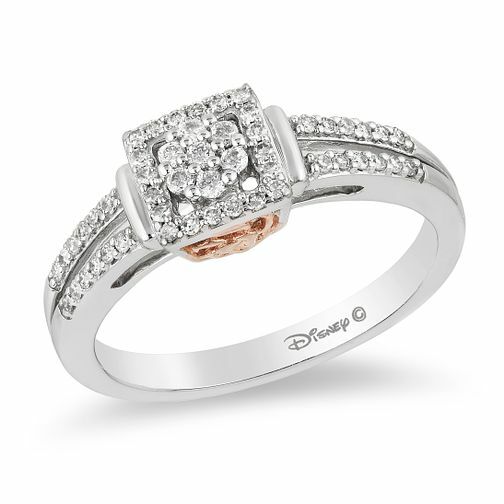 Enchanted Disney Fine Jewelry Diamond Belle Ring is rated 4.2 out of 5 by 6. Rated 5 out of 5 by Anonymous from Fit for a queen My Fiancé proposed with this ring in Feb. 2018, and I still love it over 12 months on. It is different to a lot of other rings and has a classy vintage feel about it. I have had so many nice compliments on it, and it shines beautifully in the light. Absolutely love it! Rated 5 out of 5 by Anonymous from LOVE IT! My fiance bought me this ring as an engagement ring since I have such a intense love for Disney. He couldn't have got a more perfect ring. Its absolutely stunning. It deserves a million stars.